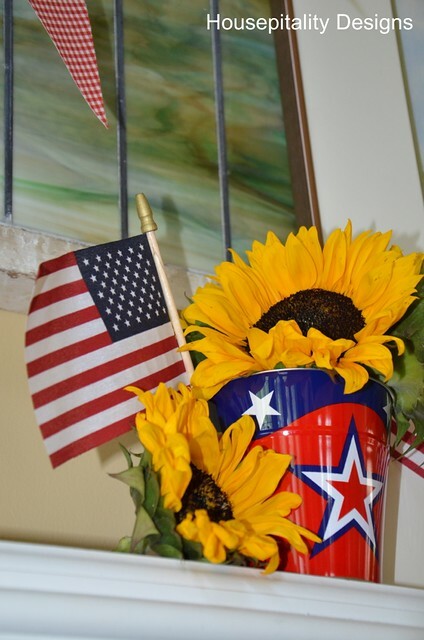 Your mantle and tablescape are so pretty and patriotic. I adore the stained glass on the mantle. 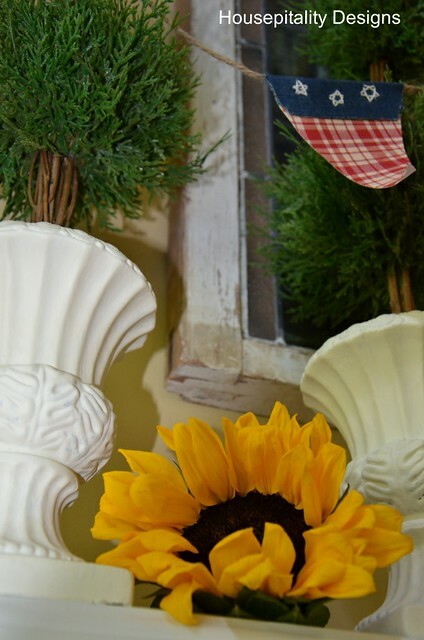 I always enjoy seeing summer vignettes that do not include shells, etc. because I never think they quite “go” in Colorado. I remember the fun we had (and money we spent) during our many craft fair adventures. Your finds look great…mine are long gone hopefully, to someone who is enjoying them as much as I did. What a surprise to see my breakfast room table on your blog. Thanks for the kudos. It is too hot to celebrate this year on the deck so I had to bring the festivities into the AC!! And since there are no fireworks this year in Colorado, I bought a few fun toys for Jackson and we will all celebrate with the confetti poppers. 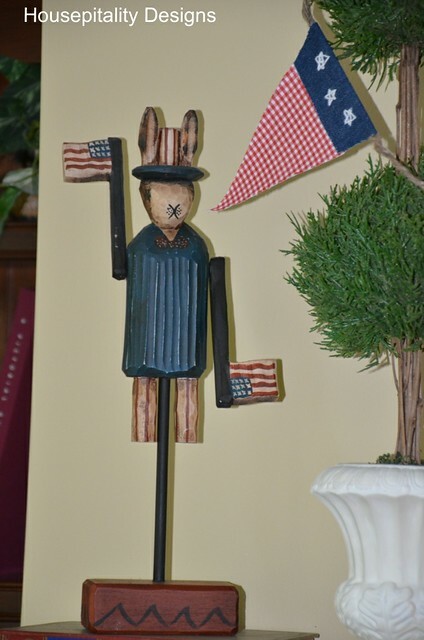 Happy Fourth to you and Tom! Enjoy! Your mantel looks beautiful! I LOVE the stained glass window! 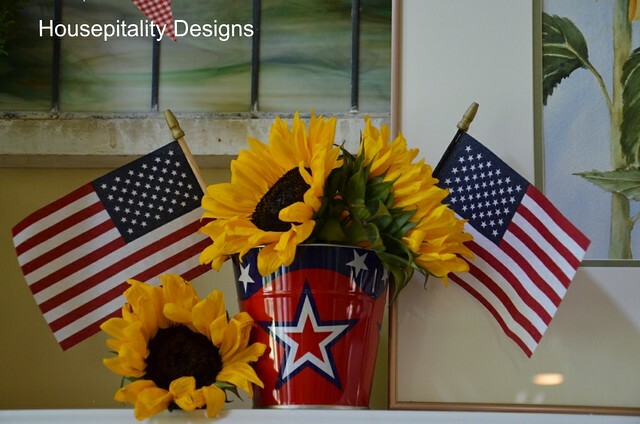 Have a Happy 4th!! Everything looks fantastic! I love that stained glass window that was the first thing I noticed. Happy and Safe 4th. What a sweet mantel, and I love seeing the sunflower painting you were telling me about. What a beautiful piece by a talented artist. I love your wee little Uncle Sam’s. I don’t blame you for holding on to those either. 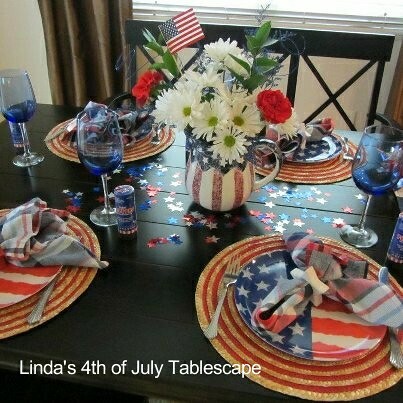 Linda’s tablescape is just beautful and perfectly put together. I especially love the flag pitcher b/c I am such a pitcher nut. That is a fabulous idea for a Bloggy Party – to feature posts about non-bloggers. Can you only imagine the “hidden” talent there is out there. 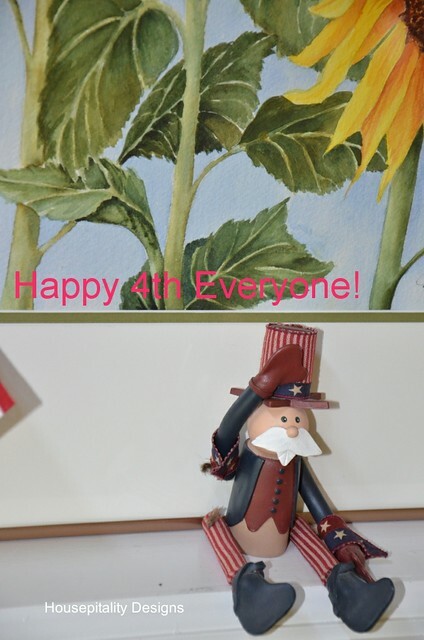 Hope your 4th is a wonderful one and a safe one too. Hugs, my friend. I love, love, love your mantel!! So pretty. Happy Fourth!!! Enjoy your day. I have a thing for bunnies, so I love your mantle. The bunting is really cute too! Just the right amount without being too much. 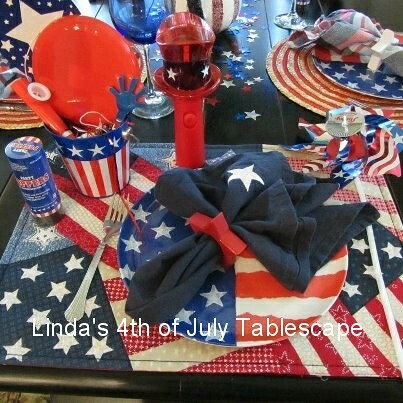 Linda’s table looks awesome. We are generally at someone else’s place on this day, so I have very little of the red, white and blue with which to decorate. Looks like the same is not true of you! I liked your table of a few days ago as well. Happy day! ADORE SUNFLOWERS!!!!!!!! Lovely job, that stained glass is so gorgeous. Happy 4th! Love your collection and the sunflowers. Love your mantel. Hi! I’m not sure you got my comment so I’ll do this again. Love your mantle. Nice collection and sunflowers are some of my favorites. 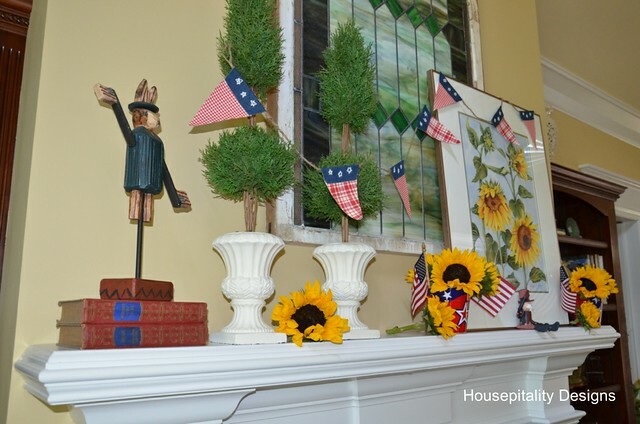 Shirley, I love your patriotic mantel!! 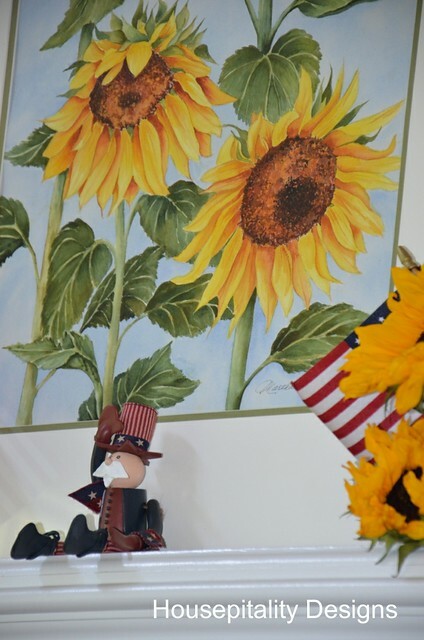 That sunflower painting is just gorgeous! 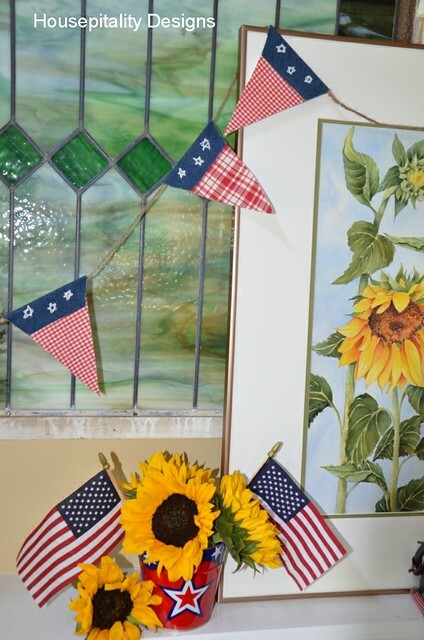 Looks like you have captured the spirit of independence in your summer mantel! No one does a mantle like you! I so enjoy seeing your decorating styles displayed on your blog, whether for holiday or a seasonal change — always displayed, and photographically captured beautifully and artfully. We are spending the 4th with my brother at his cabin outside Bryson City. 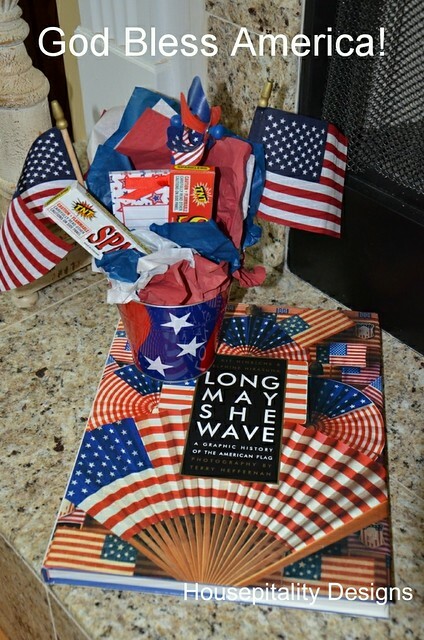 Hope you had a wonderful 4th! 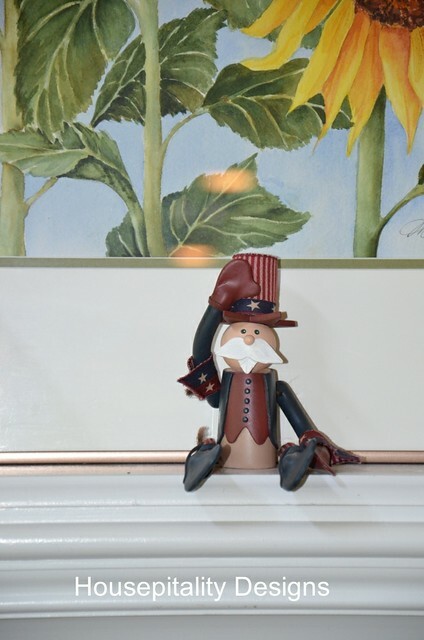 I love how festive your mantel looks! The little flag pennant style banner is such a cute addition. 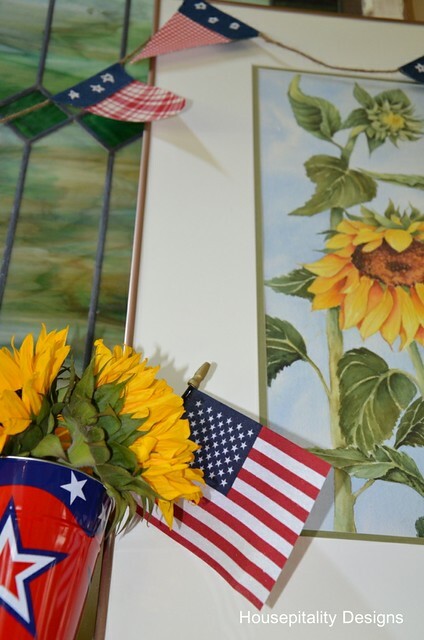 The sunflower watercolor is perfect for summer. I’m always impressed with anyone that can paint like that. I didn’t get that gene! Ha! Hope you had a wonderful holiday yesterday. 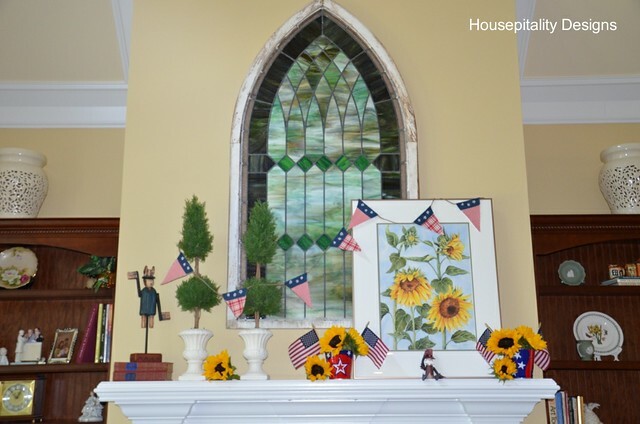 Hi Shirley, The stained glass is gorgeous on your mantle and I love your patriotic collection! Shirley, I love your mantel. The sunflowers are a favorite of mine. I am always so disappointed that the cut flowers don’t last long. Oh, to have that beautiful watercolor to look at and knowing it will never wilt. 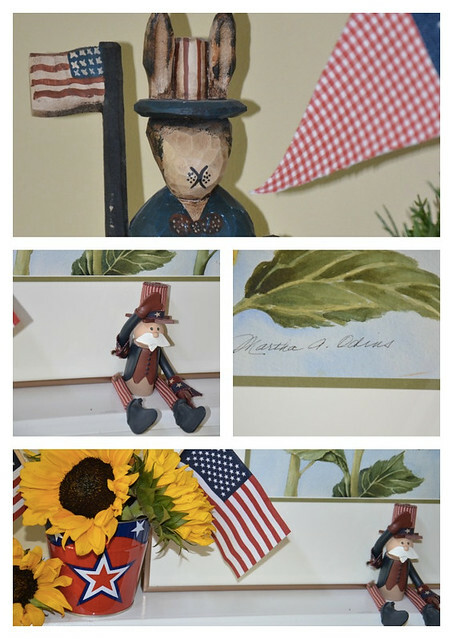 Love the Uncle Sam figurines. So glad you saved them. Tell Linda her table looks awesome. How sweet of them to get you that book! I just love your stained glass above the mantel…I remember the story of your hubby buying it for you!! Hope you had a great 4th!! I’m crazy about your antique stained glass window. Looks like you did more 4th of July decorating than me. This has been such a whirlwind summer for me, I don’t know if I’m coming or going! Everything looks great! Shirley, this all looks great! So patriotic and inspiring! The sunflower watercolor is amazing, so real! She is very talented! Each item is precious! I love the tablescape too! Belated Happy Fourth!